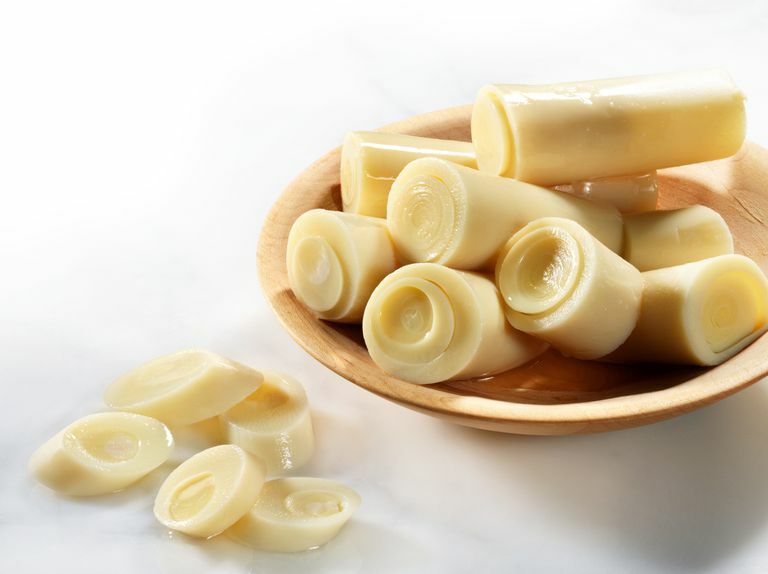 Hearts of palm are tender, white cylinders that have a mild flavor similar to artichokes. They’re often found in salads but can also be cooked and served as a side dish. Hearts of palm are low in calories and a good source of vitamins, easy to find in grocery stores, and can be added to any healthy, balanced diet. Hearts of palm serving sizes vary from brand to brand, but on average, one heart that is 3 1/4 inches long has less than 50 calories, with most of those calories coming from roughly 10 or 11 grams carbohydrates. It also has one gram of protein and one gram of fiber. It has no fat and is a good source of potassium, copper, Vitamin B6, and zinc. Canned hearts of palm will have more sodium than raw hearts of palm, which have almost no sodium. Hearts of palm are low in calories so they make a good addition to any weight loss diet. Fresh hearts of palm are good for a heart-healthy diet because they’re very low in fat, have no cholesterol, and are low in sodium. What exactly is a heart of palm? Hearts of palm are essentially the inner core of some types of palm trees. The tops of the stems are harvested and the outer fibers layers are removed until the soft inner core is left. Are they related to artichoke hearts? Artichoke hearts and hearts of palm are from two different plants, although they can often be used in similar ways. Some people feel that hearts of palm have a similar flavor to artichokes, and sliced hearts of palm are about the same size as artichoke hearts, so it's easy to get them confused. In the past, most of the hearts of palm found in the United States were imported from Brazil, but these days, most of them come from Costa Rica. Hearts of palm are also grown in other Latin American countries and parts of Asia. Is heart of palm a fruit or a vegetable? It’s considered a vegetable, similar to asparagus. Hearts of palm are commonly found year-round in the vegetable aisle of your grocery store, usually in cans or jars. They’re either cut into small pieces or in longer stalk-like shapes. You might be able to find fresh hearts of palm in the produce section as well. Look for hearts of palm that are unblemished and slightly soft, but still firm to the touch. Canned hearts of palm can be stored for an extended period of time in your cabinets or pantry until you’re ready to use them, but keep any leftovers in the refrigerator. Fresh hearts of palm should be refrigerated as soon as you get home from the grocery store. They’ll keep for a week or two. Raw hearts of palm can be sliced into bite-size pieces and added to a bed of salad greens. Top with a light citrus vinaigrette or oil and lemon juice. Hearts of palm can also be baked or even pan-fried and served as a side dish or eaten raw as a simple low-calorie snack. These recipes all feature hearts of palm and include other healthful ingredients. Adding hearts of palm to your balanced diet is a great way to add good nutrition without adding many calories. They're tender enough to be eaten raw so they’re perfect for salads. Fresh hearts of palm may be best, but if you can only find canned hearts, be sure to look for varieties with less sodium or give them a good rinse to reduce the sodium content. Produce for Better Health Foundation. "Hearts of Palm. Nutrition. Selection. Storage." United States Department of Agriculture Agricultural Research Service. "USDA Food Composition Database." United States Department of Health and Human Services and U.S. Department of Agriculture. "2015 – 2020 Dietary Guidelines for Americans." 8th Edition.